Posted: Wed Sep 06, 2017 11:30 am Post subject: Sept 8, Updated Fire map and info. On Page 2 is a new Sept 7n and 8 fire maps and some information and maps regarding the fire. I will update as new information comes in. 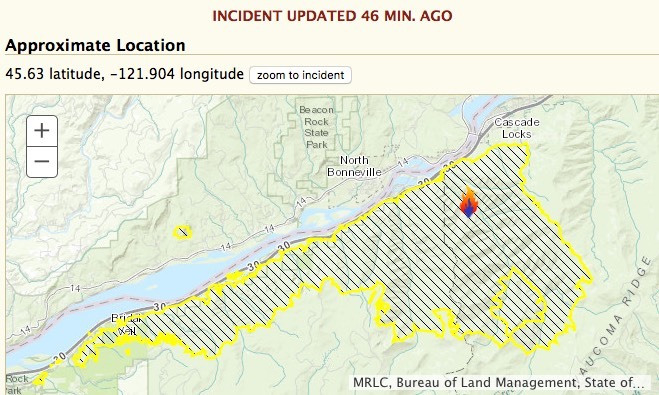 Today: Eagle Creek and Indian Creek fires have merged in the Columbia River Gorge and are now burning an estimated 30,929 acres, according to state and federal officials who worry that shifting winds could push the fires eastward on Wednesday. Fire expands (8:26 a.m.): The Eagle Creek fire is burning over 30,929 acres, Lauren Maloney, a spokesperson for incident information, said Wednesday morning. It is zero percent contained. Columbia River still closed (8:22 a.m): A twenty mile stretch of the Columbia River east of Portland closed Tuesday afternoon by the Coast Guard remained closed Wednesday morning. The river from mile marker 126 to 146 was closed to all vessel traffic, establishing a safety zone "to protect personnel, vessels and the marine environment from potential hazards created by falling hot ash and firefighting aircraft landing on the river." After experiencing explosive fire behavior on the Eagle Fire last night, firefighters were successful at holding fire growth to moderate levels during the day. An infrared fly-over has estimated the fire to be 20,000 acres. The Eagle Creek and Indian Creek Fires have merged together and will be managed as one incident in the future. A spot fire, which spread across the Columbia River early this morning, is approximately 30 acres and is being managed by a Washington DNR Type 3 Team. 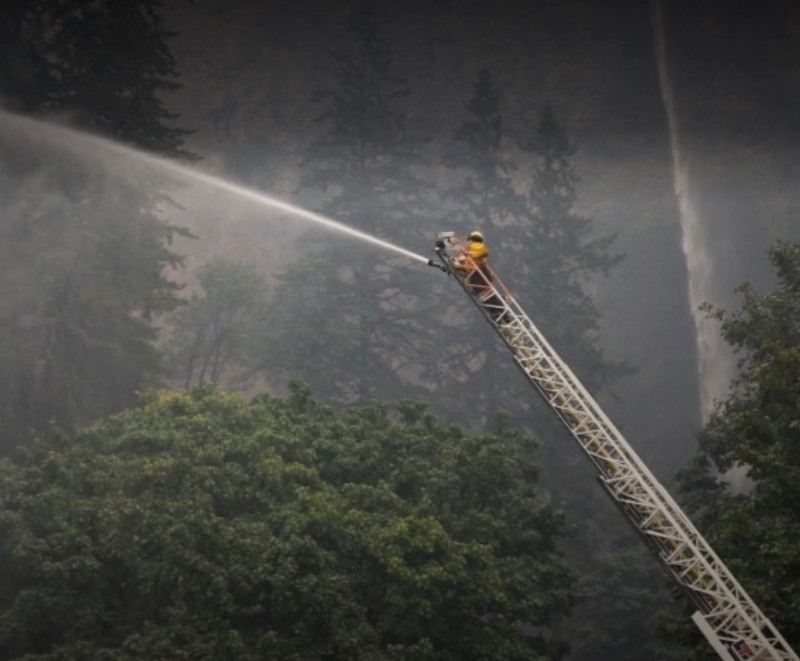 Unified command is happy to report that the historic Multnomah Falls Lodge, built in 1925, was saved by Oregon State Fire Marshal’s structural firefighters. A task force of structural engines and one aerial ladder truck worked in conjunction with a strike team of water tenders to keep the lodge wetted down during the fire storm of falling embers. Large trees nearby torched and fire crews used hose lines to protect the lodge from heat. Visit the Eagle Creek and Indian Creek Fires Facebook page to see pictures of the lodge. In addition to structure protection, I-84 remains closed from Troutdale to Hood River due to rocks, snags and other debris entering the roadway. Oregon Department of Transportation will be working closely with the Unified Command team to determine when it will be safe to open. East winds are expected to continue tonight, but overall the weather will be calmer than the previous night when substantial fire growth occurred. Temperatures are expected to be cooler tomorrow, but a Red Flag Warning will be in effect in the afternoon for potential lightning. Winds will shift westerly which could propel fire growth to the east of the current fire perimeter. "Liz FitzGerald, 48, of Portland said she’s fairly certain that she heard the teenager’s friends — including a boy who was video-recording with his cellphone and some girls in the group — giggle as the firework dropped down a cliff and into the trees below. But her reference to an existing wildfire that had forced the closure of the trail miles ahead and her warnings about reckless behavior drew no response, she said." Posted: Wed Sep 06, 2017 11:58 am Post subject: Infrared video of fire & more details about kids capture. Mike, do you have a link to the origin of those two fire perimeter maps? Tuesday was a quieter day on the Eagle Creek Fire. The fire did not make large runs or show the extreme fire behavior it did the night before. With the shift to westerly winds, the southeast corner of the fire, near Indian Mountain, became more active with some crown runs. An infrared flight last night mapped the fire at 30,929 acres. The Archer Mountain Fire north of the Columbia River is 112 acres and is being managed by a Washington Department of Natural Resources Type 3 Team. Extent of fire at 12:30 PM today. Mike B. heard a report from someone who drove Hwy. 84 during the closure. They reported trees and rocks on the pavement but felt that the fire damage to Gorge trees was patchy and not the devastation that one would expect. I hope this report is accurate and that the shift to west winds does not leave to new burn in the same area. This would be great news on the patchy nature of this and we're hoping the winds cooperate! Officials say the Eagle Creek Fire entered the Bull Run watershed Tuesday. The watershed provides drinking water for around 1 million Oregonians. It is the primary source of drinking water for Portland and many of its largest suburbs, including Gresham and Beaverton. A community meeting for the Eagle Creek and Indian Creek fires will be at the Hood River Valley High School at 6:00 p.m. on Thursday, September 7th. The meeting will be in the Bowe Theater. The address is 1220 Indian Creek Road, Hood River, Oregon 97031.